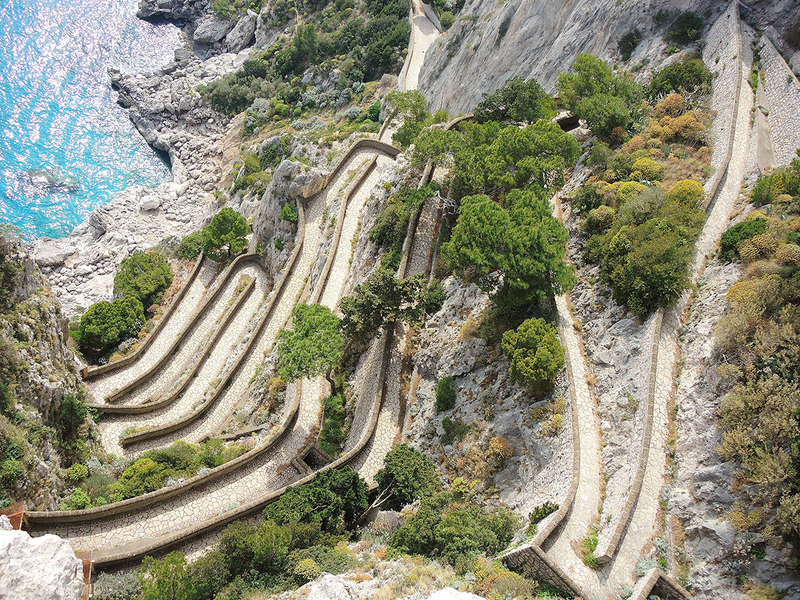 THE MAGICAL ISLAND OF CAPRI HAS CHARMED VISITORS FOR CENTURIES. 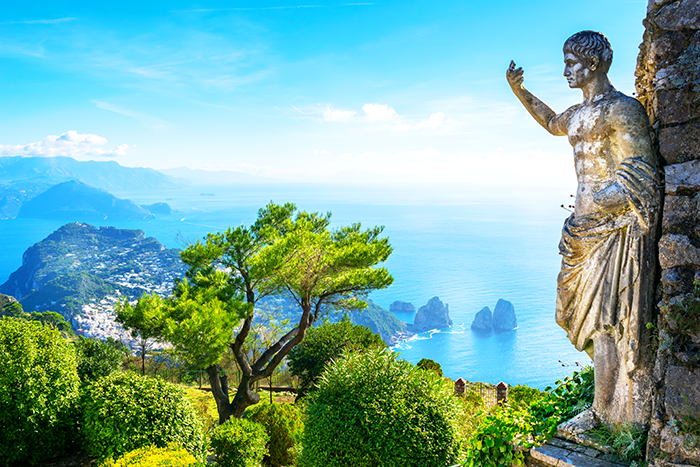 “Capri”, a small island in the bay of Naples in South Eastern Italy, is the land of remarkable wine, fine Mediterranean cuisine, classy perfumes, and romance. It was the resort island for lords and ladies, and today it is still the destination for the riches, including celebrities, politicians, and even royal families. 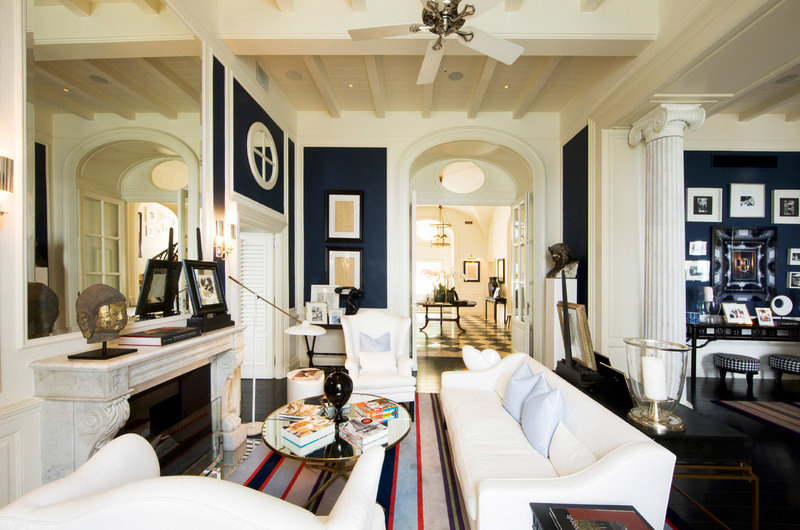 So, don’t be alarmed by the number of high-end boutiques, expensive brands, and 6-star hotels. 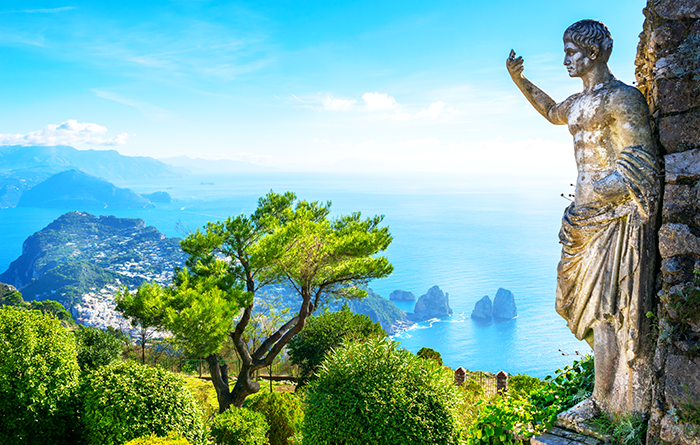 Anacapri sits on a steep mountain on the western coast of Capri. Catch a red taxi into the town and ride the ski lift to the scenic point on top of the mountain where you can literally see panoramic views of the whole island, including the famous Sorrento Peninsula. The amazing sceneries from above will keep you breathless and you will wish you could stop time and enjoy the views for eternity. 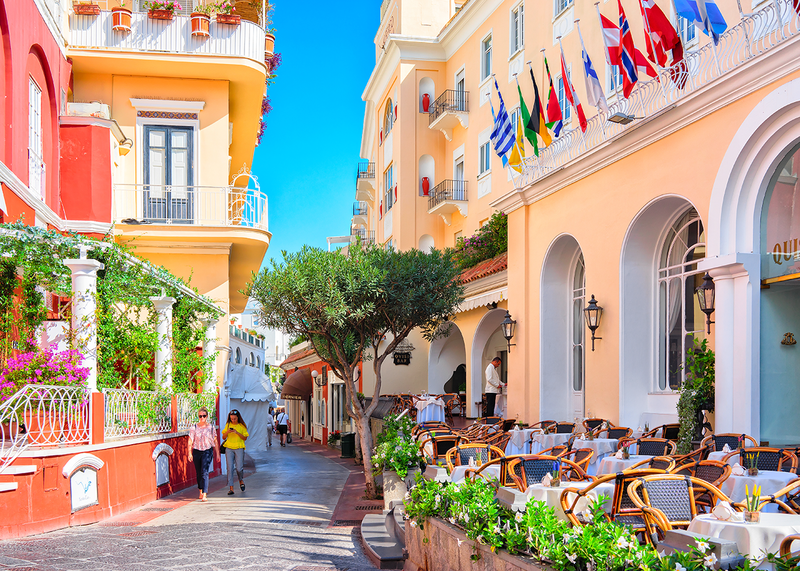 Spare some time to explore the street of Anacapri and don’t miss out Capri’s original pizza! Augustus Garden is just a few minutes drive from the city center. 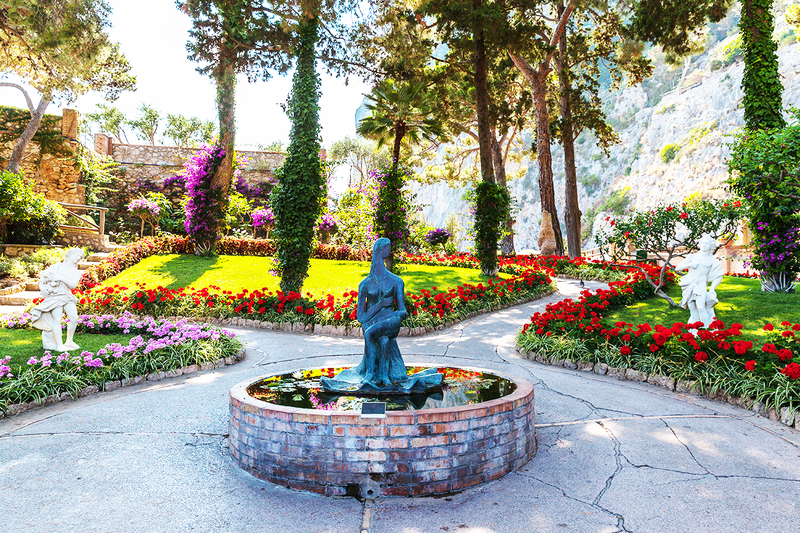 The fascinating garden above steep mountain commands spectacular views of the calm blue water of Mediterranean Sea with majestic cliffs contrasting the vast scenery. If the sky is clear, you might see large flock of sea birds flying in the background, making the whole experience looks like beautiful scene from a movie. Built in 14th century, The Charterhouse of Giacomo was established by Count Giacomo Arcucci, a lord in Capri and the advisor of the Queen of Naples. The building is now a museum and holds many interesting art collections. 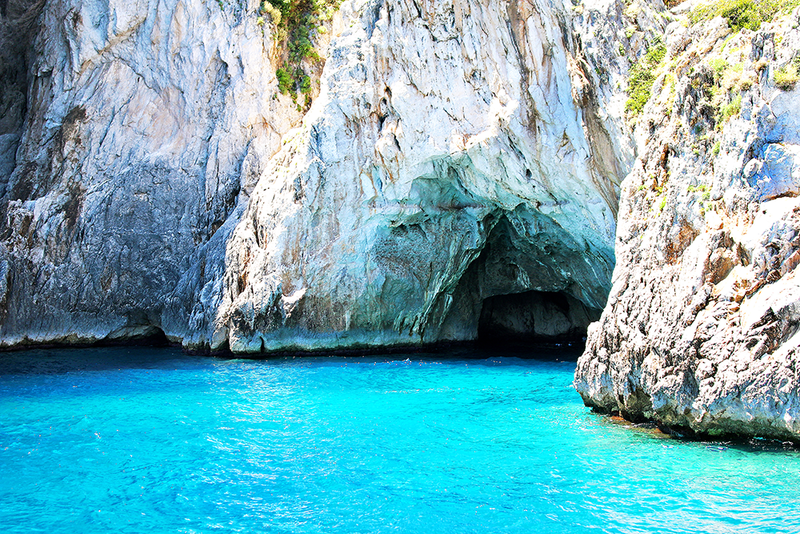 Blue Grotto is a cave with a very low entrance. The entrance is only a meter high and you have to lay flat on a boat to get inside. School of fishes can be seen through the crystal clear water and the cave reveals its true beauty once you pass the entrance. It’s a spectacular display of sparkling lights passing through small cracks and splashing shades of blue on the dark ceiling of the cave. The best time to visit Capri is August. During this time the weather is warm and the seafood from Mediterranean Sea is at its best. Freshly made Capri lemonade served on ice is the best lemonade you’ll ever have as Capri is known to grow the best lemon in the world. Capri is home to agriculture and fisherman communities. Quality local ingredients are reflected clearly in Capri’s delicious cuisine which uses fresh ingredients grown under the warm sunlight of Southern Italy. 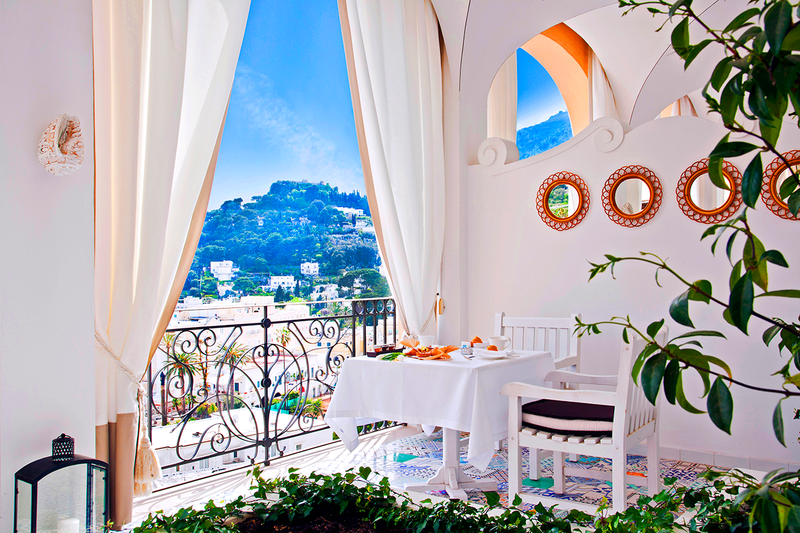 Stylishly decorated in elegant white, grey, and black, JK Kitchen serves refined Mediterranean cuisine in a cliffside location of JK Place, one of Capri’s most popular boutique hotel. Native Neapolitan Chef Eduardo Estatico creatively crafted fresh caught seafood and organic seasonal ingredients into his specialized traditional Neapolitan slow food such as Sea bass poached in acqua pazza, and Cod drizzled in Vesuvian olive oil with puttanesca sauce. 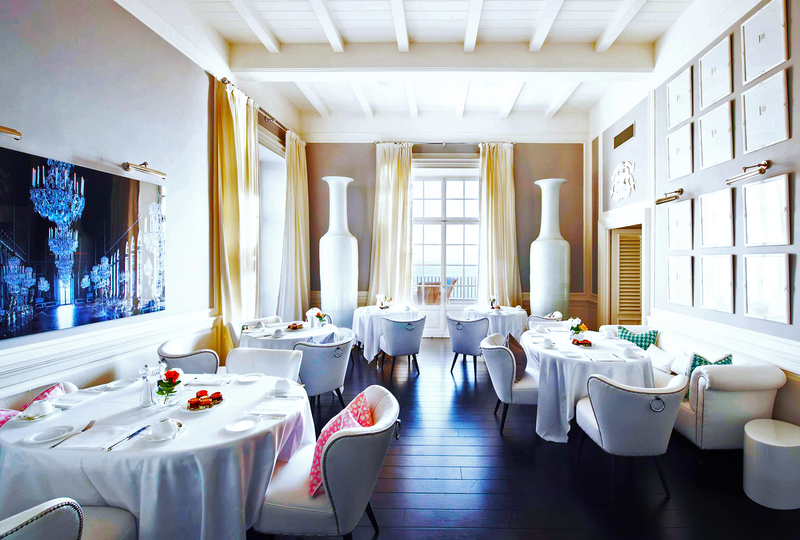 Just like our first restaurant, La Terrazza di Lucullo is a splendid restaurant in an iconic hotel – Hotel Caesar Augustus. 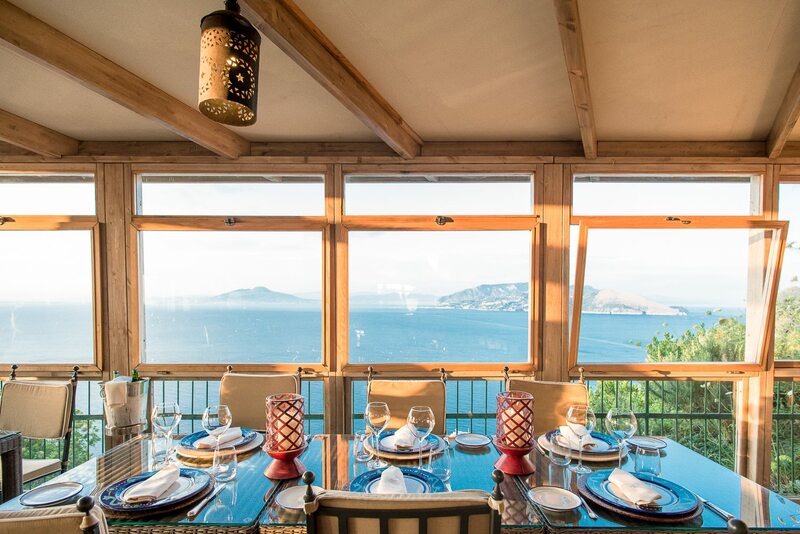 Dine on a clifftop terrace overlooking Sorrentine Peninsula and the Bay of Naples, the restaurant serves Capri on a plate with vegetables and herbs sourced locally or grown in the kitchen garden and fresh fishes delivered directly by fishermen every morning. The secrets to impressive dishes here is not much of a secret. They are simply quality and passion put together carefully with cooking technique to create dishes that exalt the flavor, aroma, and freshness. 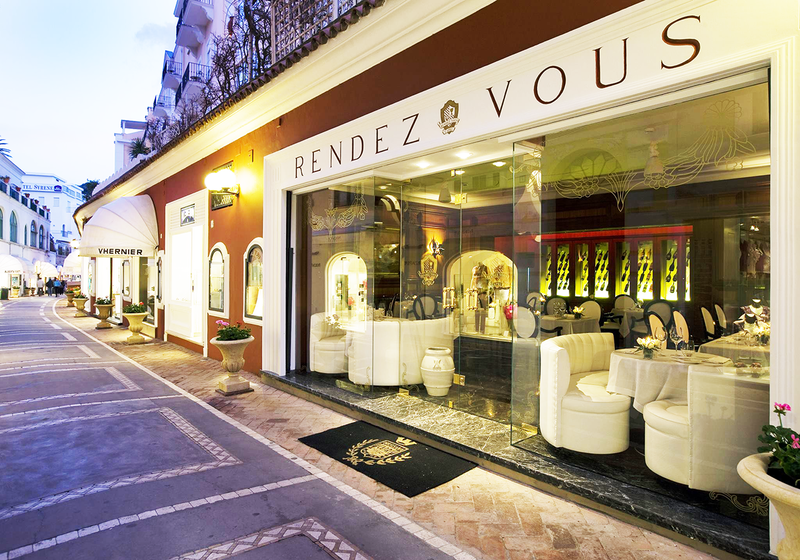 Rendez-Vous is the place to meet and eat on Capri. 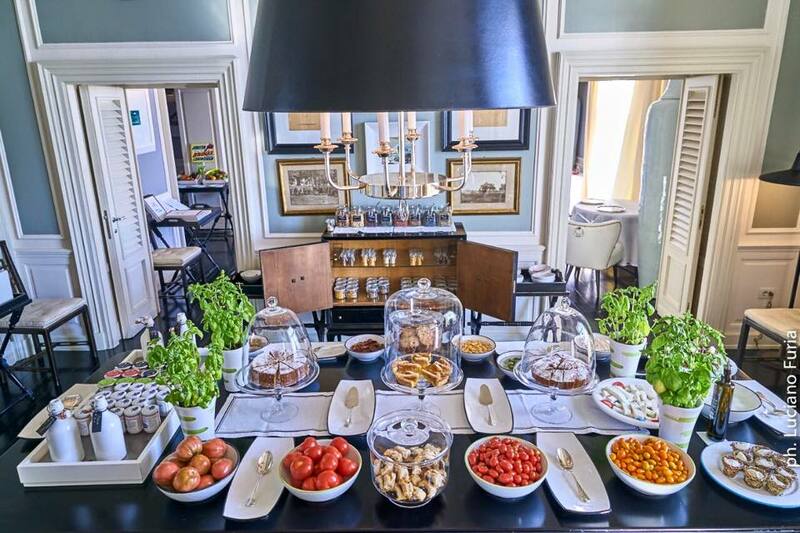 Set on Via Camerelle Street in front of the famous Grand Hotel Quisisana, the luxury restaurant offers effortless elegance and gourmet cuisine. The ornate dark wood panel wall plays the role of the supporting actor to the leading white leather banquettes and glossy black Louis chairs, while the white glove service provides a luxurious start to your fine dining experience. Expect a list of savoury traditional Caprese menus as well as some international flairs like zucchini flowers filled with delicate ricotta, ravioli stuffed with local caciotta cheese, and grilled swordfish with capers and veal cordon bleu with fired potatoes. Setting itself into the cliffside, JK Place Capri overlooks the unobstructed panoramas of Mediterranean blue sea and the port below. The sophisticated, yet cosy design allows sumptuous amount of natural lights inside and brilliantly use shades of white against dark and wooden décor, as well as the deep blue sea and bright sky in the background. There are only 22 rooms available but most of the rooms are superbly appointed with modern amenities and terraces with unparalleled views of the Bay of Naples. JK Place is simply an elegance home away from home you’d love to return every year. 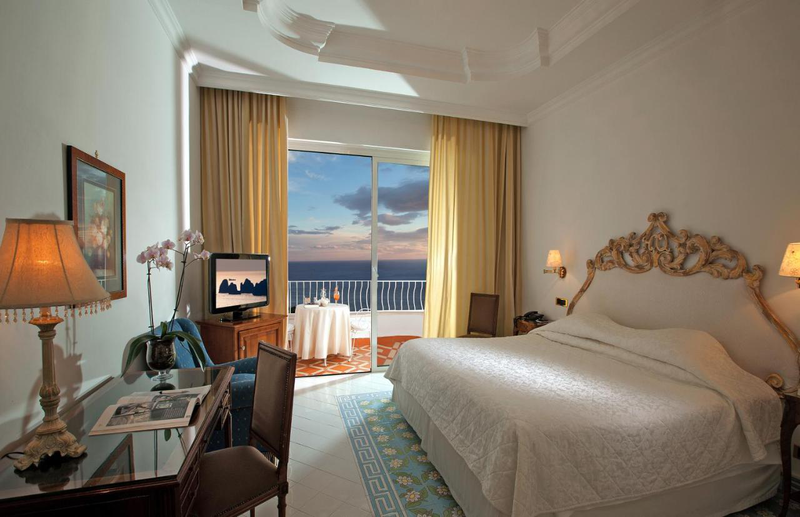 Intimacy and exclusivity are keys to Capri Tiberio Palace. The 5-star hotel shines as the destination for sophisticated jetsetters, and it has always been an intimate and private retreat since the 1900s. 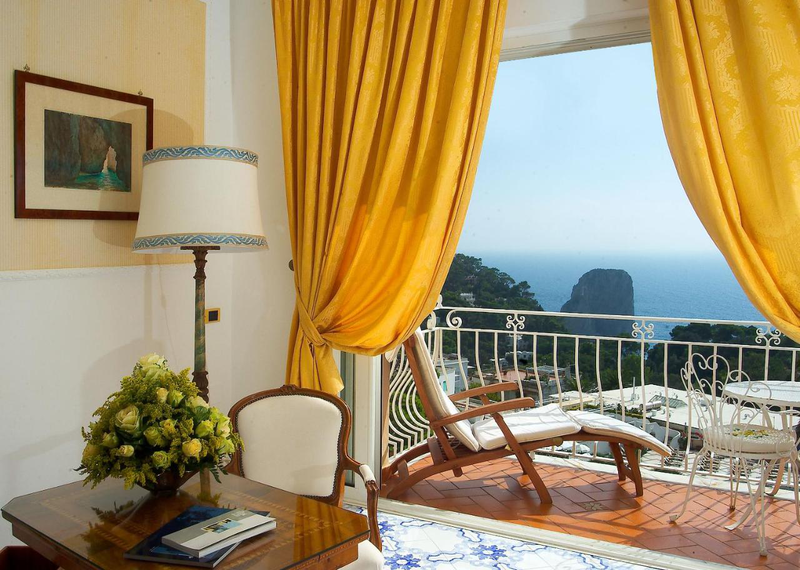 The luxury boutique resort exhales timeless glamour of the 1950s and offers an unequalled experience in the heart of Capri within a short stroll to the famous Piazetta. And although you are surrounded by amazing list of restaurants in Capri, you’ll find the only Kosher restaurant on the island at the hotel’s La Terrazza Tiberio restaurant where Mediterranean cuisine and fresh ingredients meet Kosher tradition. Caesar Augustus turned a 2 centuries old private retreats for artists and intellectuals into a lovely luxury hotel for discerning travelers around the world. Perched on a cliff edge 300 meters above the sea, Caesar Augustus boasts 49 beautiful rooms and 6 magnificent master suites in white with playful splashes of fresh lemon, peach, and turquoise colours. 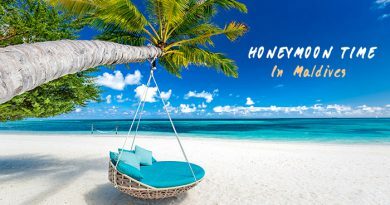 Guests will enjoy double level infinity pool and the secluded wellness center in the garden that looks out to the skyline where deep blue sea touches the bright blue sky. 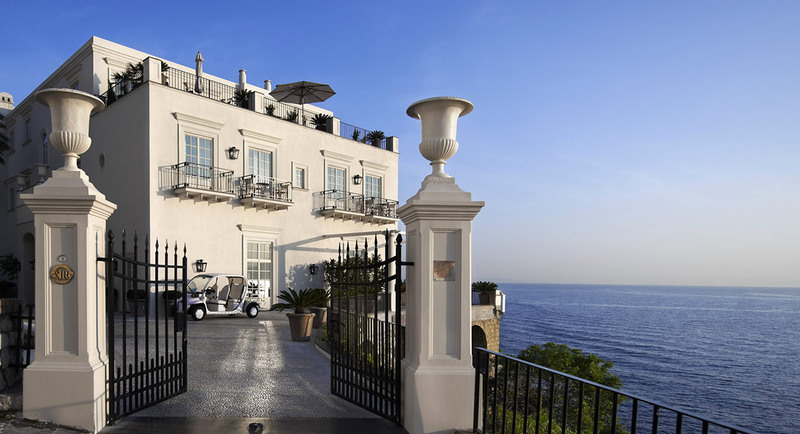 The rich and famous has been walking through the iconic entrance of Grand Hotel Quisisana Capri since its establishment in 1845. Inside, a luxurious oasis of peace and tranquility where shimmering chandeliers, elegant décor, and the warmest welcome await. The rooms and suites are washed in Quisisana’s trademark bright white to bring out the lush green island, bright Mediterranean sky, and deep turquoise water backdrop. Your suite may already feel like a memorable retreat, but for an ultimate relaxation, let yourself sink into the warm water of the spa pool at QuisiBeauty Spa and allow the expert hands pamper you.